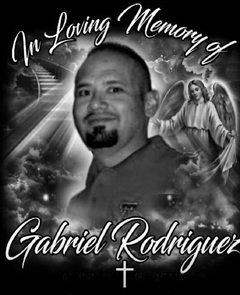 Viewing for Gabriel Rodriguez, 38 of Lubbock will be Monday, September 17, 2018 12pm-4pm, in Calvillo Funeral Home Chapel. Cremation arrangements were made under the direction of Calvillo Funeral Home and Chapel. Mr. Rodriguez passed away on Wednesday, September 12, 2018 in Lubbock. He was born February 19, 1982 in Lubbock to Manuel Rodriguez and Janie Meza. He worked in construction as a trans flooring technician. Gabriel was a very happy individual who always had a good outlook on life and enjoyed spending time with his family, in particular; his nieces and nephews. However; his greatest joy in life was reading his bible and spreading the word of the Lord. He is preceded in death by his father Manuel Rodriguez, a brother Isaias Rodriguez; his grandparents Manuel and Demecia Rodriguez and a step brother Jacob Meza. Survivors include his mother Janie and step father Juan Meza of Lubbock; brothers Frankie Rodriguez, Manuel Rodriguez, Israel Rodriguez and Elias Rodriguez all of Lubbock; sisters Delores (Michael) Elizondo and Victoria Lopez both of Lubbock; step brother Joshua Meza of Lubbock; a host of nieces and nephews.